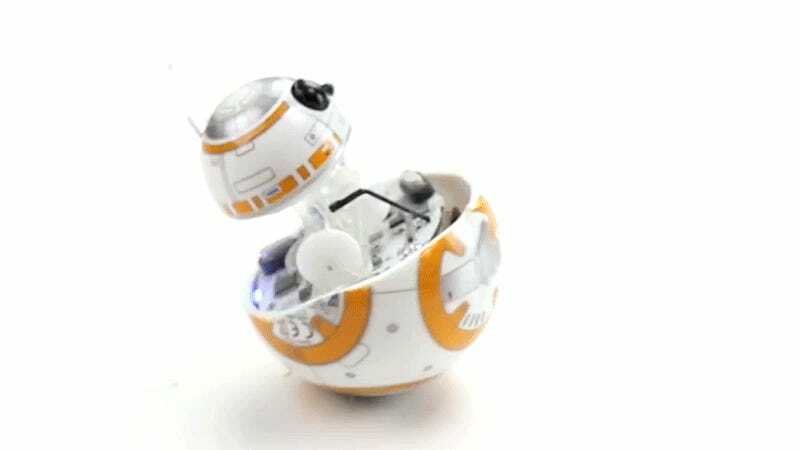 If you were lucky enough to find one of Sphero’s wonderful BB-8 toys on Force Friday and are curious how it works, the folks at uBreakiFix were kind enough to hack theirs open to explore its inner workings—so you don’t have to sacrifice yours. There aren’t too many surprises inside BB-8, though. His spherical body is made of a thick, durable plastic that protects a gyroscope-stabilized two-wheeled rolling mechanism inside. A heavy counter-weight on the bottom (in addition to a wire induction coil) helps keep BB-8’s internal mechanism upright at all times, while the strong magnets that keep his head attached are finally exposed.